Colour is fascinating. Some people believe that you can change your luck by putting on a colour that is favourable for your zodiac sign. Russian artist Wassily Kandinsky claimed that colour is a power which directly influences the soul. And in Thailand, each day of the week is associated with a specific colour. In this edition of Bangkok Boogie, we visit two exhibitions which are also full of colour. Visit 100 Tonson Gallery from now until November and you will enter a fantastical and colourful alternate universe created by Thai-Japanese artist Yuree Kensaku. This exhibition is considered a site-specific painting installation and for the three and a half months before it opened in June, visitors were welcomed to observe as Yuree worked in the gallery and changed it into her studio. The seemingly fun and manga-like illustrations may look cheerful at first glance but they betray darker undertones upon closer examination. Building on the concept of discomfort, Yuree uses these cartoonish beings and landscapes to manifest various issues and struggles she has personally encountered. These are divided into four sub themes. First she appears as a girl riding a huge lobster confronting enemy foods, alluding to her personal food allergies and past life-threatening experiences from consuming these items. In the next wall, she transforms typically feared and scary animals into cuddly cute creatures, thus removing any danger associated with them. We then move on to a seaside where mermaids wear frozen fake smiles on their faces amidst a rubbish-filled beach. There is in fact a play on the word “mermaid” (“ngueak”), which also means boring, tired or ugly in Thai slang. The last theme, with its skeletons, bombs and crashing waves, refers to several events of global concern, including the Rohingya refugee situation and the bombing of Erawan Shrine in 2015. For Yuree, perhaps the act of depicting these bleak events and deep anxieties in colourful mural-like drawings, is a cathartic expression and also a means by which we can understand her interpretation of the world around her. The title of Nipon Intarit’s photo exhibition at RMA Institute was Som, which is the Thai word for orange. Far from being documentations in the photojournalistic style, these photographs present settings suspended in time, stripped of their narrative context and where meanings are blurred. The exhibition makes reference to a political landscape where truth is discontinuous and religion can become a suppressive force. 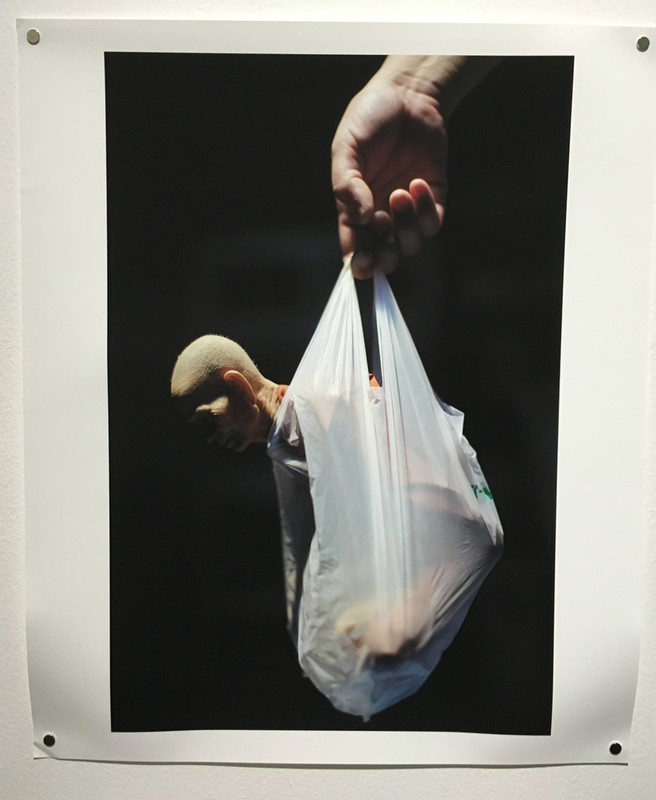 Some photographs seem to question the sanctity of human life in the midst of such oppression while others depict religious icons and figures in ambiguous settings. Delving deeper into the connotations of the colour, one could even see som as an uneasy reconciliation of the red and yellow shirt movements – you get orange by mixing red with yellow – that have rocked Thailand in the recent years. 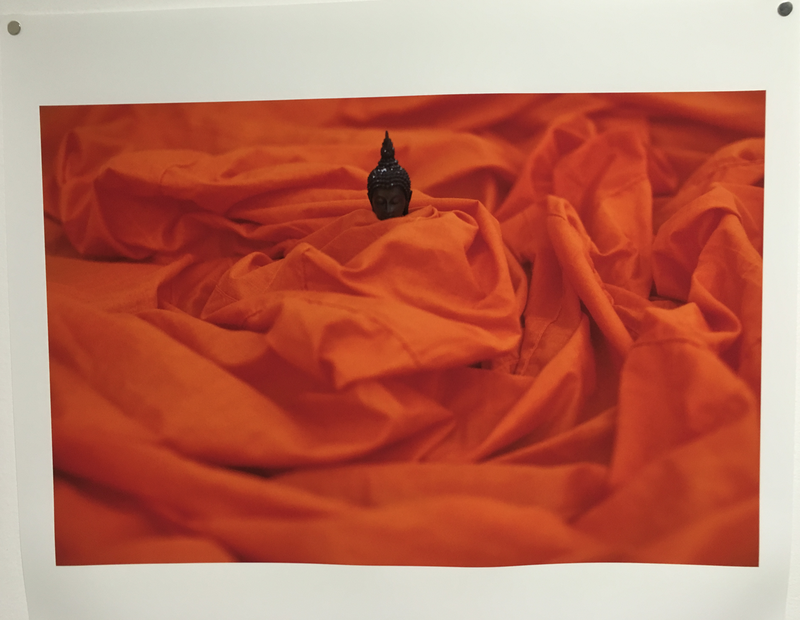 At the same time, orange can also be the colour of the robes on Thai monks. As we end this colour edition, I will leave you to consider the aesthetic values of these photographs apart from the political or religious readings that may have/have not been intended. Watch this space as we wrap up Bangkok Boogie in the next post!